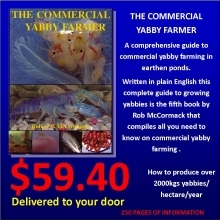 The Commercial Yabby Farmer is a comprehensive guide to all things yabby and yabby farming. 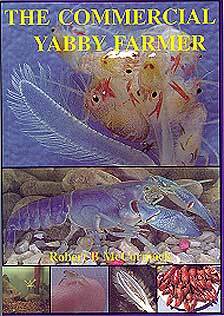 For the yabby enthusiast this book covers everything from the anatomy, diet, breeding, handling and growth whether for fun in a tank or commercially for a living. 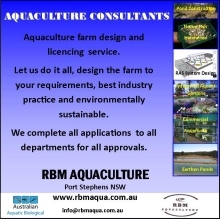 For the commercial farmer this book provides an in depth coverage of constructing a yabby hatchery, constructing yabby ponds, pond & water quality management, feeding, harvesting, production returns, packaging and marketing, etc. 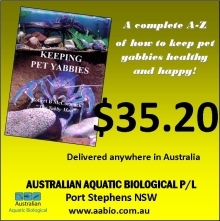 Written in plain English this complete guide to yabbies is the fourth book by Rob McCormack which compiles all you need to know in this edition. All the latest advances in research & commercial farming methods. Click the buy now button to order this book using PayPal or your credit card via our secure server. This entry was published on November 7, 2015 / Rob McCormack. 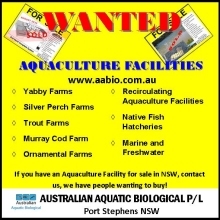 Posted in Publications and tagged books, commercial, Commercial Farmer, farmer, The Commercial Yabby Farmer, yabby, Yabby Farmer. Bookmark the permalink.